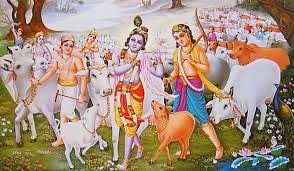 Shree Krishna who is believed to be on Earth about 5771 BCE, was born centuries before Yeshua. 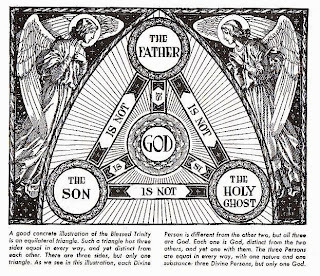 Then what is the link between both Holy souls. Shree Krishna was dark and extremely handsome. He had thick long hair with curls. He was a warrior, saint, friend, spiritual healer and extremely popular among masses. The New Testament includes no description of Jesus' everyday appearance before his death (he is only described in theResurrection appearances of Jesus). and the Gospel narratives are generally indifferent to people's racial appearance or features. The Synoptic Gospels include the account of the Transfiguration of Jesus, during which he was glorified with "his face shining as the sun." 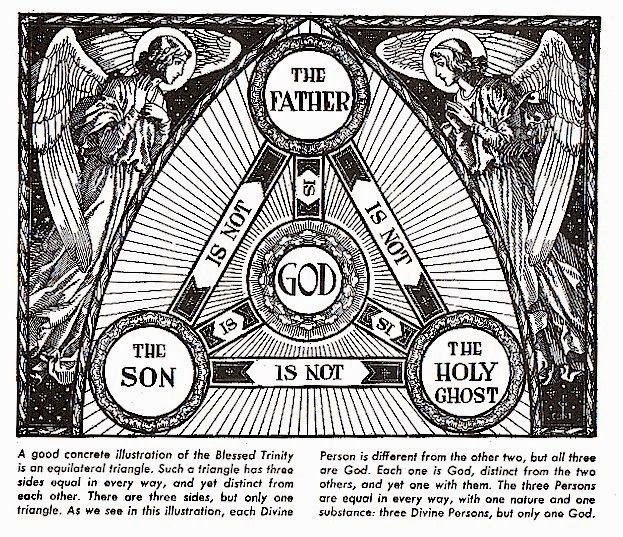 Christians believe that Christ is the son of GOD, the second personality in the Trinity. He spend a relatively short period preaching and healing (one year mainly) in the Galilee according to the synoptic gospels; three years mainly in Judah according to the Gospel of John). He was executed and ascended to Heaven. Both Christ and Krishna (Kristo) (Christos is the Greek version of the word Krishna) (are said to come back on white horse. When Bible was created, the rest of the avatars were skipped and they used only FISH and KRISTO. 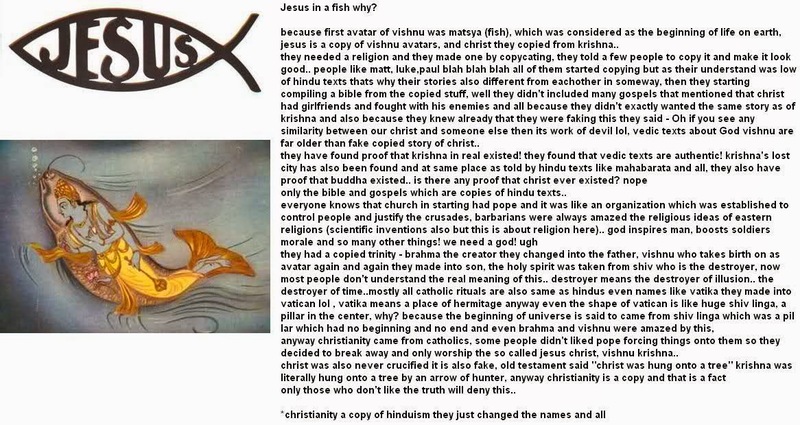 (We all know how fish is related to Shree Krishna / Kristo and to Christ) It was tried to eliminate many things related to Kristo’s life so that no one can trace the original / source for the Bible. Angle (Yog Maya) appeared before HIS birth. 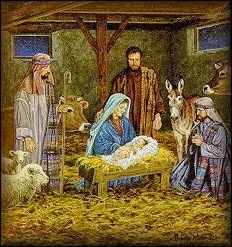 Christ birth was attended by angle, wise men and shepherd, and was presented with gifts. Kansa ordered the slaughter of thousand of Infants who feared that losing his kingdom and life. Father was warned by a heavenly voice to flee. He escaped in night to a distant land. Both worked miracles and wonders like healing leapers, the deaf, blind, rising from death and taught charity and love. 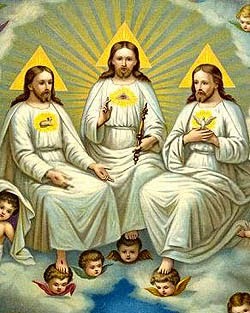 He is the second GOD of Trinity, proclaimed himself the “resurrection” and the “way to the father”. 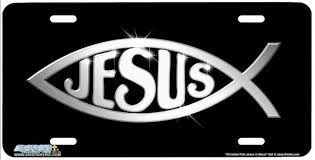 He is considered the “Beginning, the middle, and the End” (alpha & omega)” as well as omniscient, omnipresent and omnipotent. 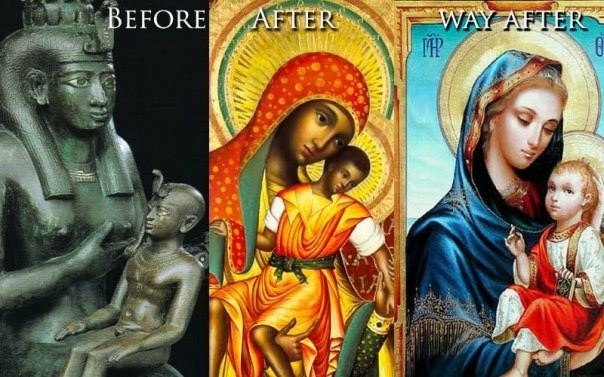 § Mark:10:19: Thou knowest the commandments, Do not commit adultery, Do not kill, Do not steal, Do not bear false witness, Defraud not, Honor thy father and mother. 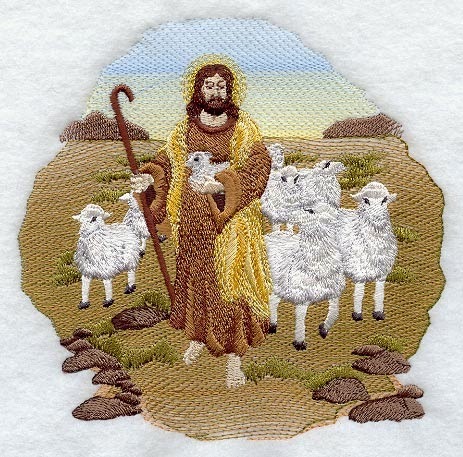 § Luke:18:20: Thou knowest the commandments, Do not commit adultery, Do not kill, Do not steal, Do not bear false witness, Honour thy father and thy mother. 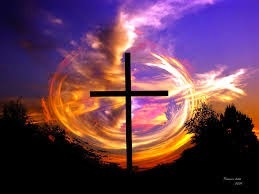 § Romans:13:9: For this, Thou shalt not commit adultery, Thou shalt not kill, Thou shalt not steal, Thou shalt not bear false witness, Thou shalt not covet; and if there be any other commandment, it is briefly comprehended in this saying, namely, Thou shalt love thy neighbor as thyself. § James:2:11: For he that said, Do not commit adultery, said also, Do not kill. Now if thou commit no adultery, yet if thou kill, thou art become a transgressor of the law. 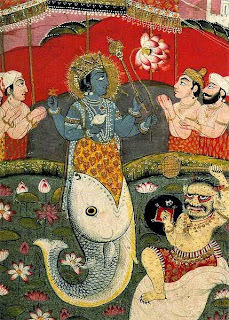 Writing about Krishna in the eighteenth century, Sir William Jones stated, "In the Sanskrit dictionary, compiled more than two thousand years ago, we have the whole history of the incarnate deity, born of a virgin, and miraculously escaping in infancy from the reigning tyrant of his country." (Asiatic Researches, Vol. I, p. 273). “Evarist-Regis Hucv, who made a journey of several thousand miles through China and Tibet, stated, "If we addressed a Mogul or Tibetan this question, 'Who is Krishna?' the reply was instantly 'The savior of men." According to Robert Cheyne, "All that converting the Hindoos to Christianity does for them is to change the object of their worship from Krishna to Christ." Appleton's Cyclopedia says this about the teachings of Krishna: "Its correspondence with the New Testament is indeed striking." 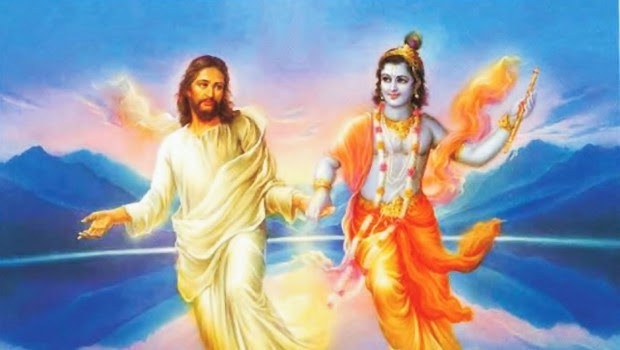 If the events in Jesus' life that appear to come from Krishna were eliminated as invalid, then most of the key Christian beliefs about Jesus would have to be abandoned: his virgin birth, incarnation, sinless life, crucifixion, descent into Hell, resurrection, ascension to heaven. Criteria for salvation, belief in the Trinity, the inerrancy of the Bible, the inspiration of the authors of the Bible by God, etc. would also have to be rejected. It will be interesting to visit this link too…. It seems that the three people are one in reality. Just stages in Shree Krishna life. Infant age, young age and old age.